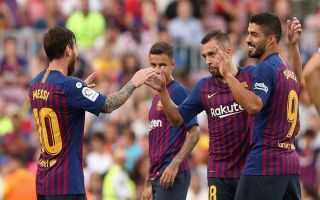 After their bitterly disappointing exit from the Champions League last season, Barcelona will undoubtedly be desperate to go all the way this time round. The Catalan giants suffered a shock exit at the hands of Roma in the quarter-finals after capitulating in the Italian capital in the return leg. Having put themselves in a commanding position with a 4-1 lead after the first encounter at the Nou Camp, the Italian outfit secured a 3-0 win at home to advance and to leave serious question marks hanging over Barca’s inability to finish the job. In turn, they’ll be desperate to put things right this year and put their nightmare behind them, and as seen below, the club have officially announced the 32-man squad which will participate in the group stage of the Champions League this time round. Summer signings Arthur, Clement Lenglet, Malcom and Arturo Vidal all feature, while exciting young talents such as Riqui Puig get the nod in the B list as he’ll now have to wait for a potential opportunity if things change later in the tournament. Given the strength and depth at coach Ernesto Valverde’s disposal, Barcelona will surely fancy their chances this season, especially with Lionel Messi still performing at the highest level. Rivals Real Madrid have dominated the competition for the past three years, but with Cristiano Ronaldo moving on to pastures new, perhaps it could open the door for their domestic foes to now make their move and get back to the pinnacle of European football. Based on the names below, they seem to have the tools required to make it a reality but time will tell if they’ve learnt their lessons from last season and it won’t be a hindrance. Full Barcelona squad: 1. Ter Stegen, 2. Semedo, 3. Piqué, 4. Rakitic, 5. Sergio, 6. Denis Suárez, 7. Coutinho, 8. Arthur, 9. Luis Suárez, 10. Messi, 11. Dembélé, 12. Rafinha, 13. Cillessen, 14. Malcom, 15. Lenglet, 16. Samper, 18. Jordi Alba, 19. Munir, 20. S. Roberto, 22. Vidal, 23. Umtiti, 24. Vermaelen, 31. Ezkieta and 33. Cuenca. List B: 26. Aleñá, 27. Miranda, 28. Riqui Puig, 29. Abel Ruiz, 30. I. Peña, 32. Monchu, 34. Collado and 35. O. Busquets.